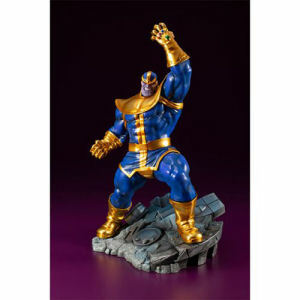 Be sure to get your Marvel Universe Thanos 1/10th Scale ARTFX+ Statue hot of the truck! Fill in the Notify me when Available and you will be the first on your block to have a Marvel Universe Thanos 1/10th Scale ARTFX+ Statue !! From the Avengers Infinity War collection by Kotobukiya. Marvel Universe Thanos 1/10th Scale ARTFX+ Statue. Measures 11 inches tall. Portrayed in a bold blue and gold costume inspired by the classic comics.